One item type that may be known to the player. Definition at line 129 of file knowledge.c. Add the item to the knowledge store. Definition at line 134 of file knowledge.c. Definition at line 137 of file knowledge.c. Referenced by knowledge_do_attempt(), and knowledge_send_info(). Definition at line 132 of file knowledge.c. Referenced by knowledge_do_display(), and knowledge_show(). Face for the type, as a basename. Definition at line 138 of file knowledge.c. Referenced by knowledge_alchemy_face(), knowledge_process_incremental(), and knowledge_send_info(). Face for an item, if not defined the face it used. Definition at line 139 of file knowledge.c. Type name for player, to use with 'list'. Definition at line 135 of file knowledge.c. Referenced by knowledge_alchemy_attempt(), knowledge_alchemy_can_use_item(), knowledge_alchemy_detail(), knowledge_display(), knowledge_do_display(), knowledge_item_can_be_used_alchemy(), and knowledge_send_info(). Definition at line 131 of file knowledge.c. Referenced by knowledge_do_display(), and knowledge_process_incremental(). Type internal code, musn't have a double dot, must be unique ingame. Definition at line 130 of file knowledge.c. 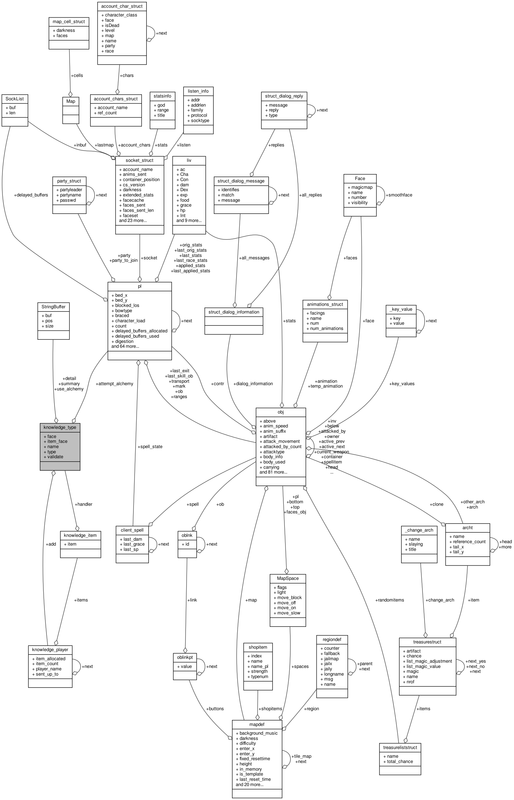 Referenced by knowledge_display(), knowledge_do_display(), knowledge_give(), knowledge_known(), knowledge_player_knows(), knowledge_process_incremental(), knowledge_read_player_data(), knowledge_send_info(), and knowledge_write_player_data(). If not null, checks if an item can be used in alchemy. Definition at line 136 of file knowledge.c. Referenced by knowledge_alchemy_attempt(), and knowledge_item_can_be_used_alchemy(). Definition at line 133 of file knowledge.c. Referenced by knowledge_give(), and knowledge_read_player_data().